I just upgraded my subscription, but now I have 2. What should I do? If you do not see this screen when clicking the link above while logged in, or your old subscription is not visible here, fill out the form below and we'll be happy to help you with this process. Can I pause my subscription to The Living Room? You bet! Simply click here while logged in and click "Cancel" on the subscription you'd like to pause. This will cancel billing at the end of your current billing period, after which you'll no longer have access to our weekly content. 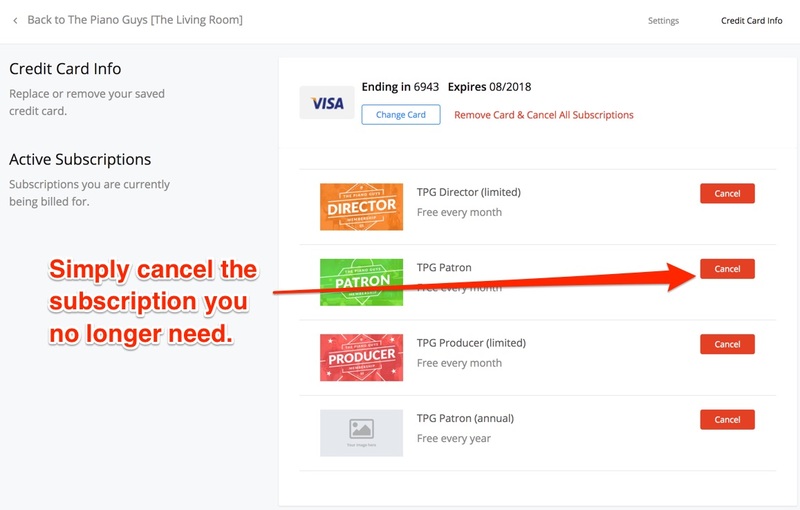 Your account at The Living Room will still be here, and you can resubscribe at any time by logging in and selecting the offer you'd like at that time. How do I cancel my subscription to The Living Room? We're sorry to see you go! Simply click here while logged in and click "Cancel" on the subscription you'd like to pause. This will cancel billing at the end of your current billing period, after which you'll no longer have access to our weekly content. Your account at The Living Room will still be here, and you can resubscribe at any time by logging in and selecting the offer you'd like at that time. I've clicked the link suggested above but it doesn't list my subscription, or lists "No Card on File." What's up? Some of our early Living Room members may have signed up via a 3rd party source. In this case, the link above may display nothing or say "No Card On File" due to your card details being with that 3rd party source. Never fear, we've got your back! Simply click here and fill out the form at this link, which will effectively cancel your subscription at the end of your current billing period. You should get a confirmation email from Stripe once your subscription is canceled. Please note, if you DO see your subscription listed at any of the previous links, this form will not initiate cancelation for you. Still need help? Just fill out the form below.